For those of you who have an interest in the arts, this is the book we have all been waiting to read. It reveals the secrets of Classical Painting by showing how great artists employed the traditions of painting, and who all used those same values and standards to achieve their wonderful works. From the front to the back it explains how Great Art was made, showing some of the best classical paintings ever created. In a strictly limited-edition of 250 books, personally sponsored by Charles, with forty-one A4-sized examples of the world’s best paintings from the National Gallery in London, all presented in brilliant full colour plates, and with two more of famous sculptures from The Royal Academy in London and The Accademia Gallery in Florence, this book practically illustrates what we should expect from Great Art. It will also leave us equipped to discover the rest for ourselves. In a world today obsessed with modern art, Charles’ book is a treasure to read and experience. We can both see and read authentically how each separate workwas made, and there is also an historical script provided which helps to place each of these beautiful works within its own historical context. The author studied Fine Art for six years at the Royal Academy in London and the Testimonials on the front sleeve of the book are evidence of an extensive knowledge. He won every artistic prize he entered during his training, including prestigious awards such as the Freedom of the City of London and was also elected to the Livery in the Guild of the Worshipful Company of Painter-Stainers. Whilst still studying at the Royal Academy, Charles was chosen by Britain’s leading art critic Brian Sewell as ‘One of the six best painters for the future’. 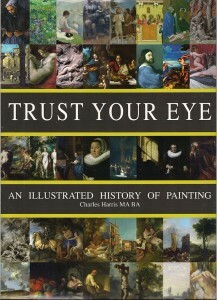 Today, after a long period of tremendous acclaim for his work, exhibiting all over the world and completing portraits for the famous, Charles has now turned to helping people reconnect with Great Art from the past by showing us how to look at this beautiful art, how to consider and understand it, and how to trust in what we are seeing. This book is therefore an artistic must for all to enjoy. Intended as a practical companion for the interested or casual reader, the art lover, the collector, or for those of you taken with aesthetics, this book will open doors with a compendium of knowledge and appreciation of classical art that has remained mostly absent for better than a hundred years. Thus representing a long period of practical study, with three attempts by Charles to complete due to pressure of prior commitments, you will discover this work is completely different and unusual in its practical written approach, while simply unique in the current artistic environment. We believe you will not want to put it down. Please note – this limited edition (at the special price of £25 plus £5.99 postage, packing and insurance in the UK) will only be available for a short time or until stocks run out. Further editions are expected to be considerably higher in price.